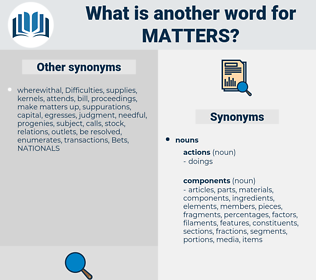 What is another word for matters? Regulations, practices, Difficulties, rules, peoples, Canadians, panels, Studies, aspects, 'affaires, dimensions, fields, Rights, Resources, Activities, enquiries, asuntos, Goals, FAQS, questions, issues, subjects, cases, problems, topics. circumstances, realm, responsibilities, inter-organization, terms, investigation, dossier, dossiers, Administered, aspect, aspects, examination, addressed, administrative, questionnaire, authorities, operations, minister, recent, relations, decolonization, provisions, format, marks, 'affaires, advancement, agriculture, rapporteur, features, inter, world, Them, litigation, agenda, organization, dimension, dimensions, charge, collaboration, implications, aspectos, corporate, conditions, stake, america, description, document, papers, coordination, adviser, a., record, Records, milestone, Anything, peacekeeping, events, security, sphere, subcommittee, programme, availability, Duties, headquarters, committee, so, stakes, proposal, technology, amur, made, amor, discipline, select, fields, servicing, sector, applied, atomic, briefs, coordinator, assembly, personnel, aboriginal, expectations, domain, reform, research, any, welfare, chart, estate, estates, awareness, Reached, Rights, special, board, political, folders, Resources, Activities, Licensing, compte, domaine, enquiries, region, crisis, results, legal, lawsuits, coverage, centre, section, sections, asuntos, allocation, promotion, chairperson, packages, statutory, labour, motor, motors, state, property, range, integrated, formal, evidence, force, catalyst, grounds, fighting, europe, Goals, space, expert, car, cambodia, forum, election, locations, haiti, factual, power, conference, tool, behalf, annex, history, neo, driving, adoption, enjeux, spots, claims, executive, officer, panel, far, plan, council, PORTS, women, canadian, score, Isa, in, h., engine, engines, ip, see, OSCE, account, english, survey, society, FAQ, FAQS, housing, news, UNCTAD, pr, suits, ground, packs, liaison, OL, Danny, economic, civil, lisbon, XXXXXX, access, pool, Lo, question, questions, counsel, financial, as, office, WIPO, issue, issues, joint, Mr., iii, 2001, april, subjects, case, cases, subject, material, materials, problem, problems, topic, topics, materia, Relating. maters, parameters, agreements, arguments, determinations, communications, relevant, realms, purposes, Recommendations, objects, instructions, temas, principles, infringements, things, assignments, Measures, investigations, clarifications, formalities, remarks, markets, streams, factors, Measurements, shortcomings, targets, deliberations, instruments, transactions, urgent, Controversies, representatives, debates, reports, Questionnaires, details, chapter, chapters, statements, parliament, METRS, Interrogatories, clusters, respects, disputes, means, reasons, incidents, allegations, times, hearts, instances, informants, differences, probes, attributes, Treaties, Undertakings, Negotiations, sources, Realities, Phenomena, questioning, relationships, complaints, charter, directions, commonalities, significance, subparagraphs, ministers, Researchers, article, articles, particulars, departments, perspectives, outcomes, credentials, criminal, particularly, partners, ingredients, registrations, corresponds, belongings, improvements, observations, organisations, constraints, grievances, obstacles, objectives, documents, deliverables, prosecutions, chemicals, judgements, Uncertainties, Respondents, Efforts, exceptions, Regulations, merits, tasks, Charges, participants, disorders, examples, answers, Judgments, trials, troubles, Referrals, jobs, sensitivities, effects, Crimes, disciplines, Organizations, assets, programmes, L, strategies, advisers, dealings, Tracks, competences, orders, seminars, organisms, accidents, trends, entrepreneurs, agendas, steps, enquires, interventions, enrolments, premises, importantly, accusations, scenarios, courses, procedures, structures, Complexities, attention, markings, associated, doubts, practices, decisions, modalities, extremes, motives, interests, sessions, me, frameworks, technologies, conflicts, Suggestions, spheres, proposals, discussions, Commodities, Arenas, solutions, references, messages, Consultations, Difficulties, mechanisms, releases, occurrences, cuestiones, FACETS, quarters, occasions, Animals, concepts, rules, imports, volunteers, coordinators, comments, Fears, subtopics, sub-topics, obligations, sectors, demands, contributions, violations, processing, heading, headings, brussels, nothing, benefits, fronts, members, contains, projects, Programs, commitments, sub-items, Categories, agents, Ideas, domains, individuals, methods, behaviours, species, defects, Bankruptcies, charts, contexts, uzbekistan, independence, Criteria, processes, Entities, systems, Interviews, viewpoints, Tests, politics, e, petitions, approaches, assumptions, portfolios, Opportunities, deals, amounts, Deficiencies, appeals, indications, ways, Occupations, senators, Medicines, needs, offences, competencies, ends, acts, requests, regions, actions, november, words, circumstances, conventions, others, positions, Hypotheses, sujets, responses, pieces, omissions, Publications, endpoints, products, applications, portions, considers, Guidelines, media, laws, Businesses, contacts, basics, indicators, Firms, inscriptions, IMPACTS, victims, cards, findings, peoples, Refugees, colleagues, ..., data, allusions, clauses, existing, talks, letters, Forums, notes, touches, Clients, Forms, Involving, pattern, patterns, Branches, deeds, Capabilities, lessons, sites, leaders, sales, boards, submissions, advisors, clothes, texts, institutions, Patients, Crises, norms, eyes, drivers, Industries, elections, rulings, dialogues, experts, Communities, -rrb-, Motions, Roles, people, Persons, notions, Territories, experiences, Plants, Families, tools, powers, Stories, hours, levels, Entries, costs, auditors, functions, CAMPS, shares, ec, choices, scopes, ;, places, exchanges, options, sets, v., plans, Agencies, pillars, values, chances, attacks, kinds, knowledge, asia, figures, signals, changes, Parties, panels, officers, actors, types, Budgets, -, Bodies, Lives, scores, directors, works, Ones, linkages, nations, counts, Classes, birds, zones, skills, sides, Studies, successes, accounts, solids, groups, kits, Countries, ", models, inputs, Surveys, gaps, dots, outlets, PTS, heads, opinions, C, date, tips, listings, responsibilities, views, controls, who, B, funds, terms, offices, units, dossiers, blocks, paras, stitches, i, aspects, :, shops, 38, administrative, Which, authorities, is, councils, operations, meeting, meetings, relations, provisions, marks, 'affaires, features, Having, agenda, organization, dimensions, 2000, goods, implications, conditions, papers, adviser, Records, events, Cas, programme, Duties, stakes, LINEs, fields, applied, briefs, personnel, estates, Rights, folders, Resources, Activities, enquiries, results, lawsuits, sections, packages, motors, grounds, Goals, forum, locations, annex, spots, claims, PORTS, engines, account, english, FAQS, suits, packs, questions, issue, issues, subjects, cases, material, materials, problem, problems, topic, topics, Relating. questioning, caseload, brandy, quiz, coordinator, welfare, question, questions, issue, subject, material. 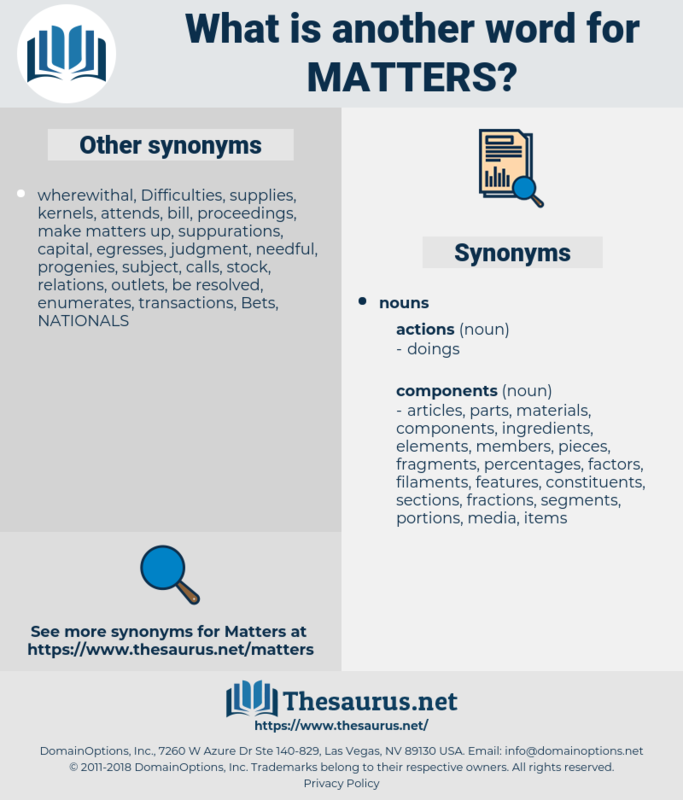 appreciation, trouble, established, Came, Dealt, needed, Were, Asked, wanted, shut, called, found, addressed, questions, materials, problems, Relating. yes, exists, relates, yeah, determinations, remains, relevance, refers, relevant, temas, Affects, mind, arrives, interest, interested, main, constitutes, prevails, relies, project, comprises, factors, reaches, takes, principal, depends, Comes, cares, covers, lies, primary, reflects, reports, expects, provides, respects, disputes, means, employs, consists, monitoring, involves, significance, perspectives, criminal, follows, welcomes, intends, includes, constraints, change, senior, Charges, Judgments, Plays, trusts, seeks, wishes, paragraph, interventions, applies, decisions, interests, brings, spheres, mission, rules, imports, hopes, headings, contains, projects, Has, domains, makes, approaches, deals, amounts, needs, acts, circumstances, considers, laws, goes, touches, rulings, experiences, ec, places, plans, changes, Does, -, counts, accounts, kits, 's, dots, Him, views, controls, who, dossiers, aspects, is, meeting, marks, 'affaires, features, aspectos, Records, Cas, fields, applied, estates, enquiries, packages, account, packs, question, questions, issues, concern, subjects, case, cases, materials, problem, problems, topics. interview, wolverine, solicit, issue, concern, deal. But that doesn't change matters! motorway, maeandra, manta ray, matador, many another, m-theory, monterrey, mature, miniature, monterey, meter, meander, menander, meadow rue, mentor, minder, manometer, mid-water, mender, meeter, Mata Hari, medawar, mediator, minter, mudder, metro, mithra, miter, monetary, madeira, metier, mother, mounter, midair, motor, mudra, motor area, monitory, manumitter, mutterer, madder, mandara, Mediatory, Mammee Tree, metre, meteor, mandatory, momentary, mandator, maitreya, mitra, maunder, man-eater, mindoro, mantra, metatheria, monandry, mutter, mandatary, minotaur, mater, mitre, minatory, monitor.